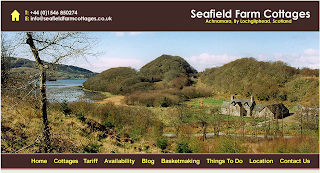 In 2009 I wrote about our first foray into beekeeping or rather, bee watching. The winter of 2009/10 proved to be exceptionally cold and when it became warm enough to inspect the hives, we discovered that the two colonies had not made it through to the spring. 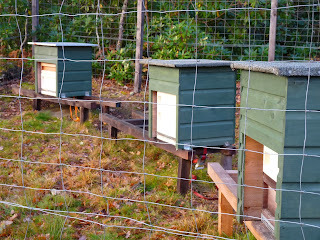 We hadn't really learned much about beekeeping so had no idea why they perished or what we could have done about it. We were not totally put off but getting new bees didn't seem to be easy. 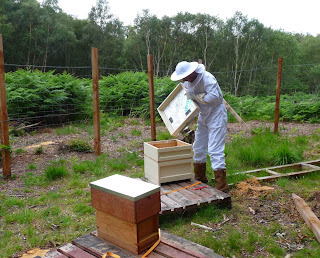 In 2012 we had the opportunity of buying a nucleus of bees from a friend who lives nearby. We spent a fortune on the accoutrements of beekeeping - a couple of hives, another suit, smokers, frames, foundation - the list goes on. We collected the bees - five frames of worker bees, stores, brood and a queen bee and transported them to their new apiary - in a sunny spot well away from the house and cottages. 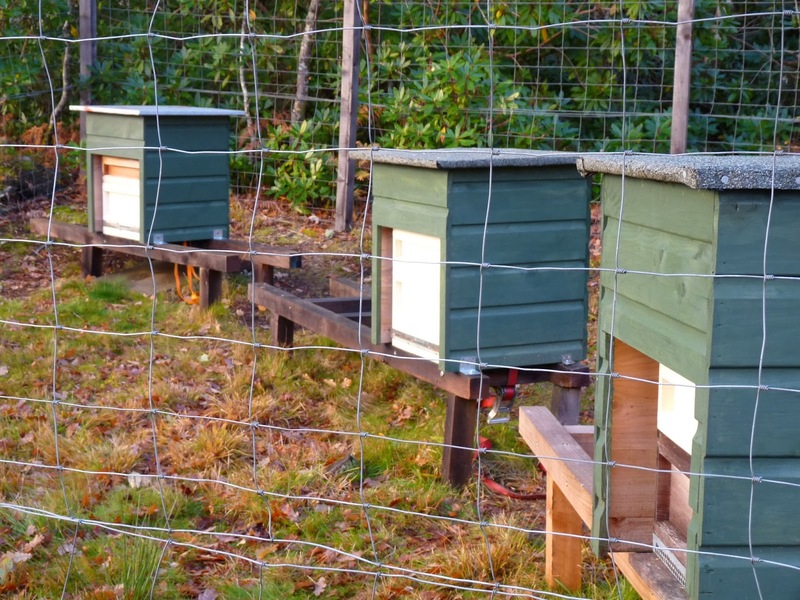 A fence was constructed to keep badgers and deer away from the hives although we hadn't thought about the pine marten which shredded the insulation under the hives in its attempt to get at the bees and their honey. 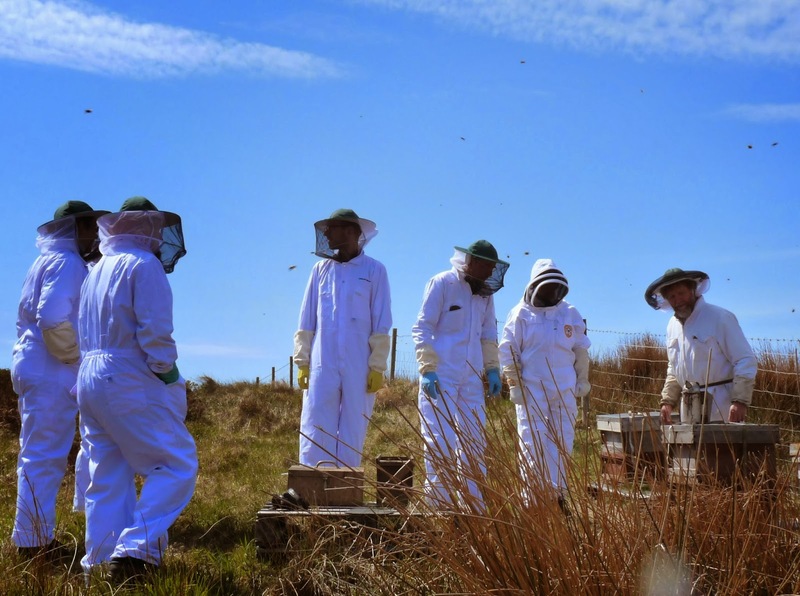 We headed off to Colonsay to attend a weekend course with Andrew Abrahams, a hugely knowledgeable beekeeper and champion of the native black bees. A huge amount of information was on hand, we may even have manage to absorb some of it. 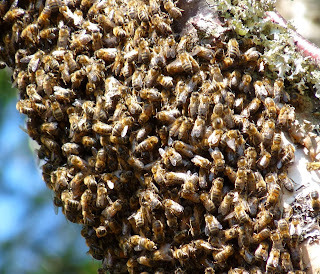 Within a few days of our return we faced our first challenge - our bees had swarmed. 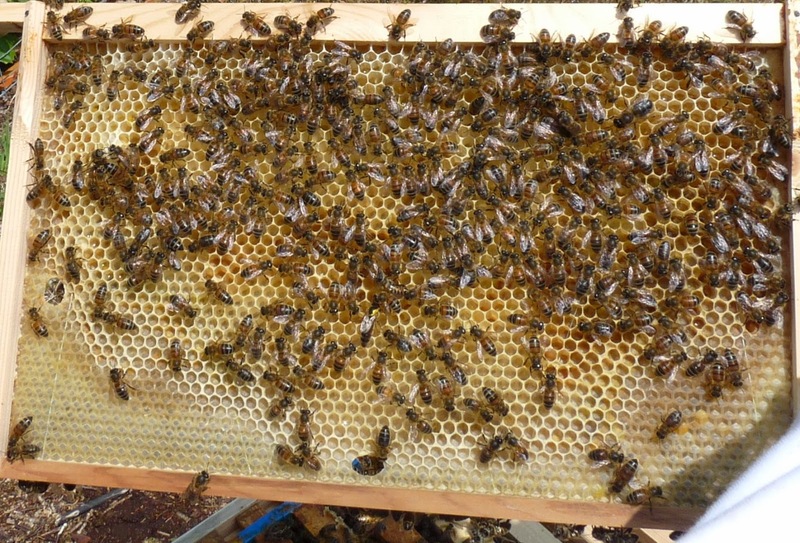 Our inexperience meant we had failed to give the bees enough room and hadn't noticed the formation of queen cells, a certain sign of the preparation to swarm. The swarm was captured and placed in a new hive but again our inexperience showed and a failure to place a queen excluder on the bottom of the hive, allowed the colony to continue its determined mission to find a new home. If we had kept the queen captive, the colony would not have left. 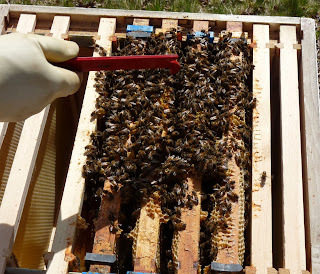 A friend came and removed frames with queen cells to another hive, leaving another two frames with queen cells in the original hive. This seemed drastic with depleted numbers but it did the trick. Another small swarm appeared which we manage to catch - this time keeping them captive. We reduced the queen cells to one in each hive and waited. And waited. And waited. After a period of time determined by several bee books, we inspected the hives to find no sign of queens or eggs or brood. Despondency. So we waited some more and amazingly discovered that we had three queens, all mated and all producing new bees. Elation. 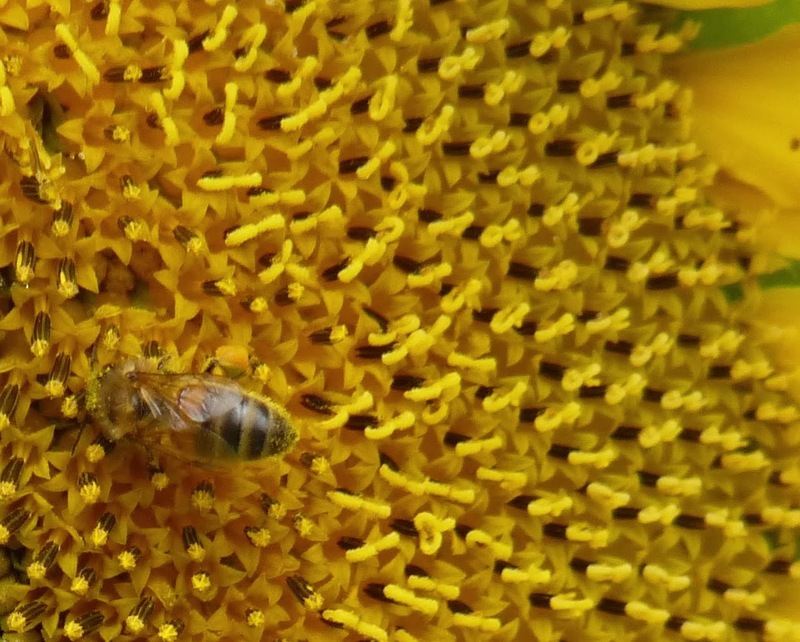 It was fortunate that our bees knew what they were doing and our ignorance wasn't a problem for them. A yellow dot was applied to identify her as a 2012 queen. This is the point at which we might have expected to be harvesting the fruits of our bees' labours. The long queenless gap and the slow build up of the colonies meant that not a drop of honey was to be seen apart from the meagre stores we left them with. Our previous winter experience was a cause for anxiety as we headed into the colder months. 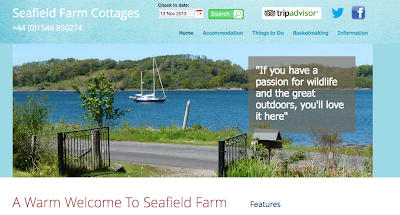 We fed them, put in insulated dummy boards and carpet in the roof and crossed our fingers. The winter wasn't particularly cold but the spring was a long time coming so we were not able to inspect our bees properly until nearly the end of April. Our smallest colony had perished. Two and a half frames of bees was marginal for getting through the winter but we couldn't bring ourselves to kill one of our queens and amalgamate the two smaller colonies. 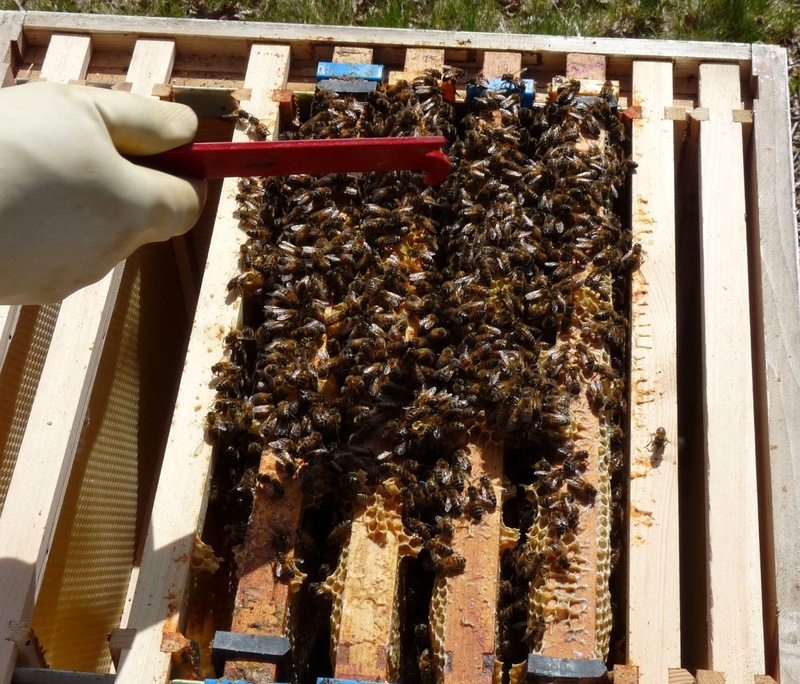 Fortunately our two stronger (but still quite small) colonies made it and spent the summer building up their numbers and building wax comb for egg laying and honey and pollen storage. A course in Moray with Tony Harris on queen rearing, gave us confidence to have a go at producing new queens using 'mini nucs' - tiny polytyrene hives which by some magic, produce mated, laying queens far more quickly than in a conventional hive. We persuaded the bees to produce new queen cells by doing an 'arificial swarm' removing the queen and flying bees to another hive, leaving the workers queenless and ready to raise new queens. 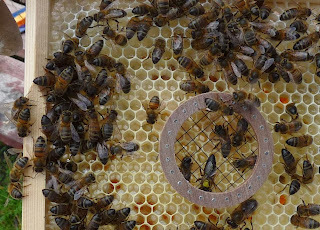 The queen cells when nearly ready to emerge were put into the mini nucs with a couple of cups full of bees. We also left a queen cell in the hive so had three chances of new queens. 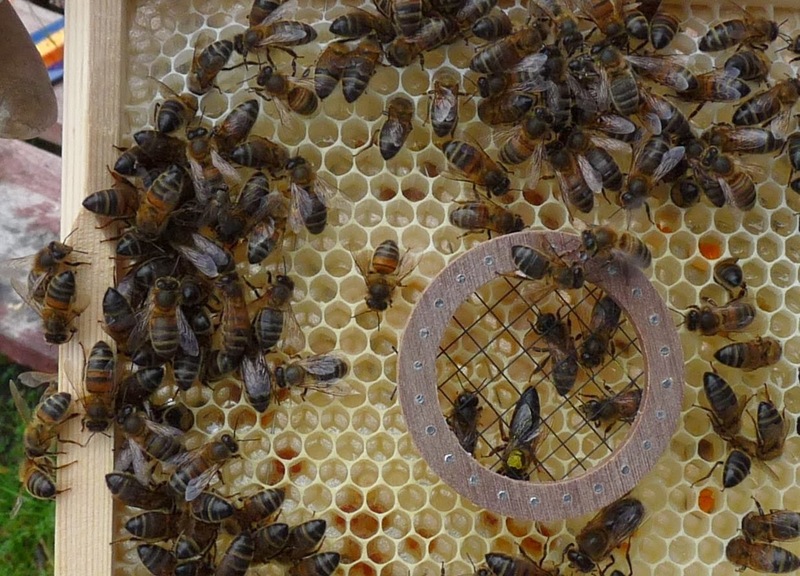 In the event, only one queen was produced in one of the mini nucs. 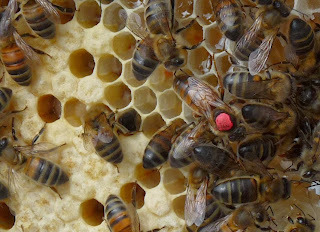 The second queen cell was 'torn down' by the workers and we don't know what happened to the one in the hive. We tried again later to persuade the bees to produce queen cells but it wasn't successful - maybe it was too late in the season. Now here we are going into winter again. 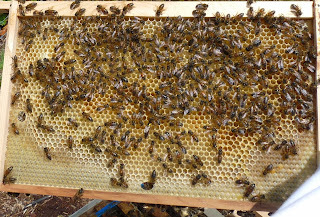 This time with three colonies of similar size, one lovely new queen and two queens which have now done two seasons so will need to be replaced in 2014. 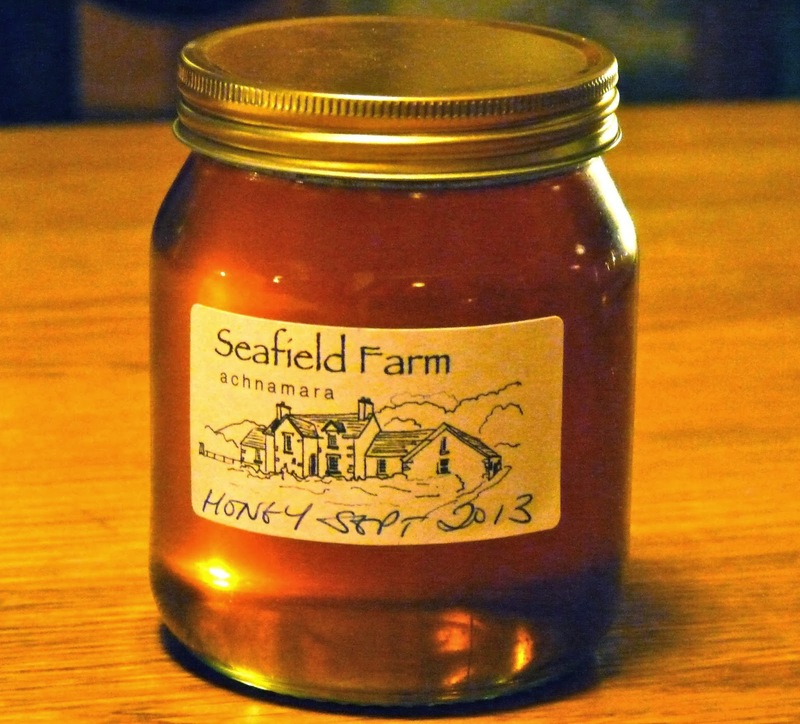 They have been fed with sugar syrup, wrapped up warmly and left with good quantities of honey. 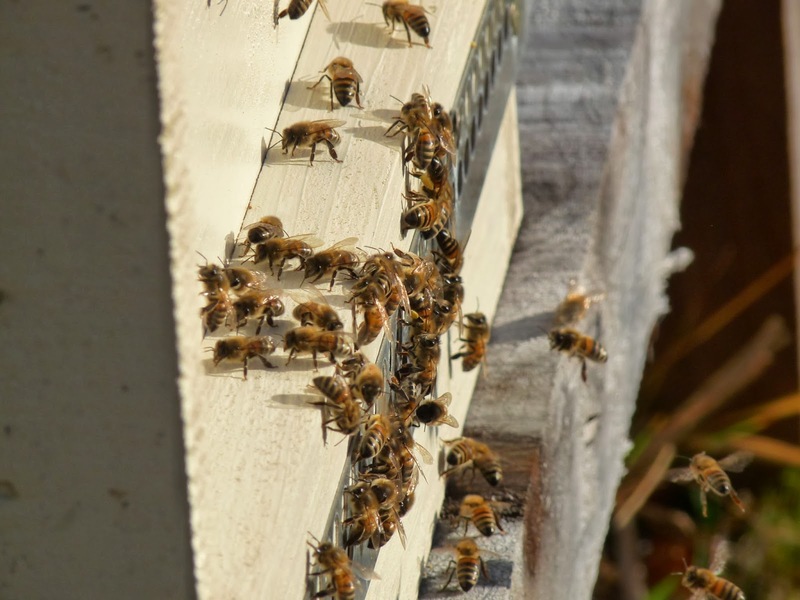 There are no signs of varroa or other disease (although it is by no means certain that we would spot them all). Slabs of Ambrosia fondant have been put in the hives and we have constructed wooden hive cosies to give them some additional protection from the rain, wind and cold. They are still flying on good days, adding ivy pollen and nectar to the stores. And best of all, we were able to harvest some of the precious liquid gold - 20 jars of honey which must have cost about £100 each. The fingers are once again firmly crossed for their winter survival. We may not be about to get rich from honey production but we have learned a lot and just hope that we get a chance to benefit from our experience in 2014. 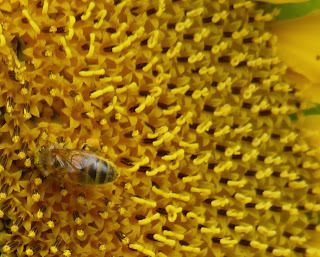 Thanks bees for all the lessons, the honey, and the entertainment and for a whole new way of gardening and observing. See you next year. 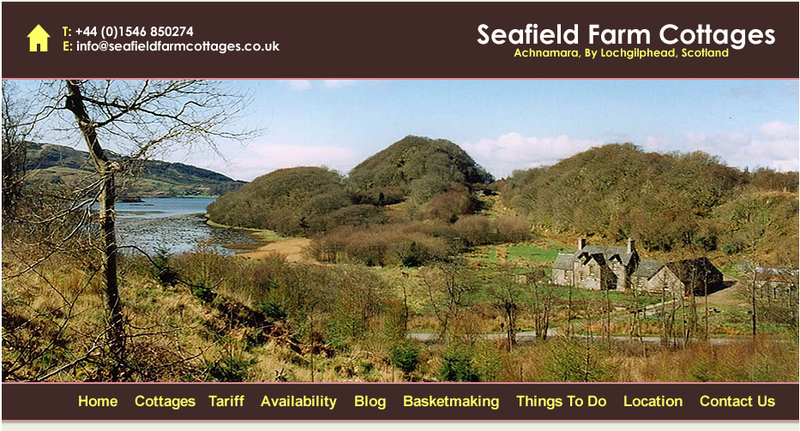 Seafield Farm Cottages has a brand new website, designed and hosted by Pole Position in Oban. 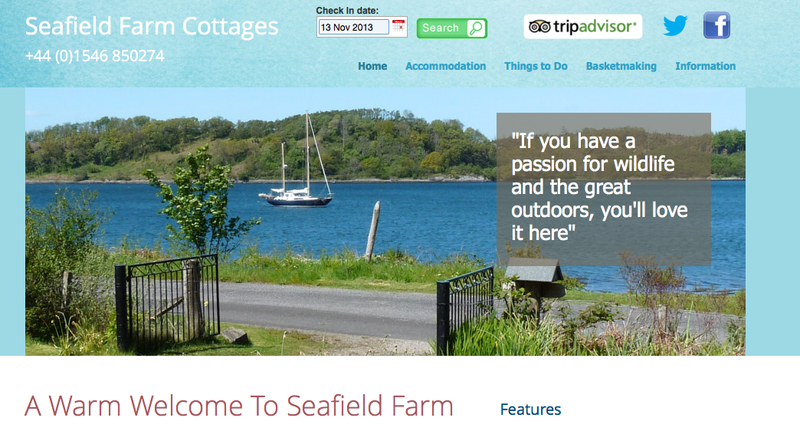 I think they have done an excellent job for us and we are pleased with the new fresh look - we hope you like it too.